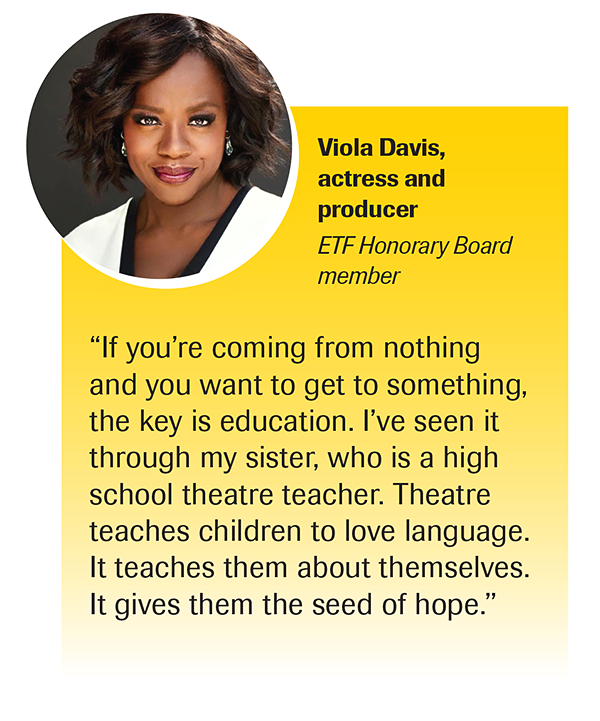 The foundation’s biggest news — aside from its launch — is the national expansion of EdTA’s JumpStart Theatre, a three-y ear program designed to train non-theatre teachers to build and sustain their own musical theatre programs. JumpStart Theatre began with a pilot program in Cincinnati. Next year, the program spreads to St. Louis and San Diego, through partnerships with STAGES St. Louis and La Jolla Playhouse and support from the Shubert Foundation. 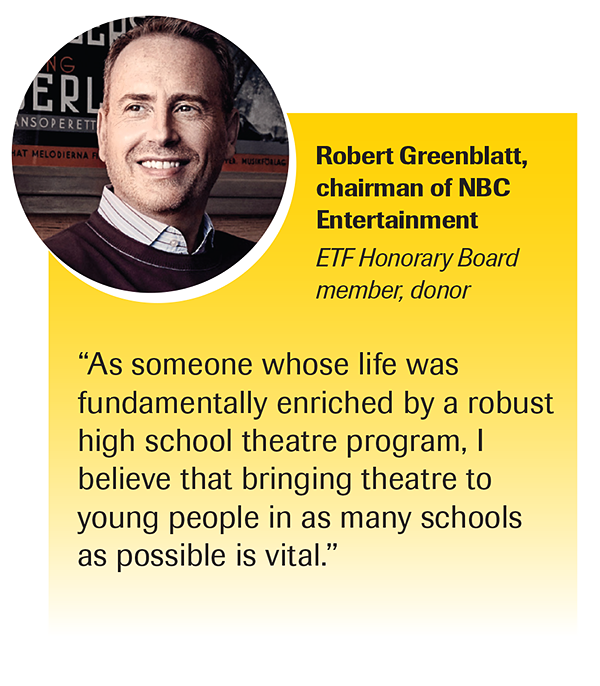 This development would not be possible without a vital and unprecedented personal gift from ETF honorary board member Robert Greenblatt, chairman of NBC Entertainment. 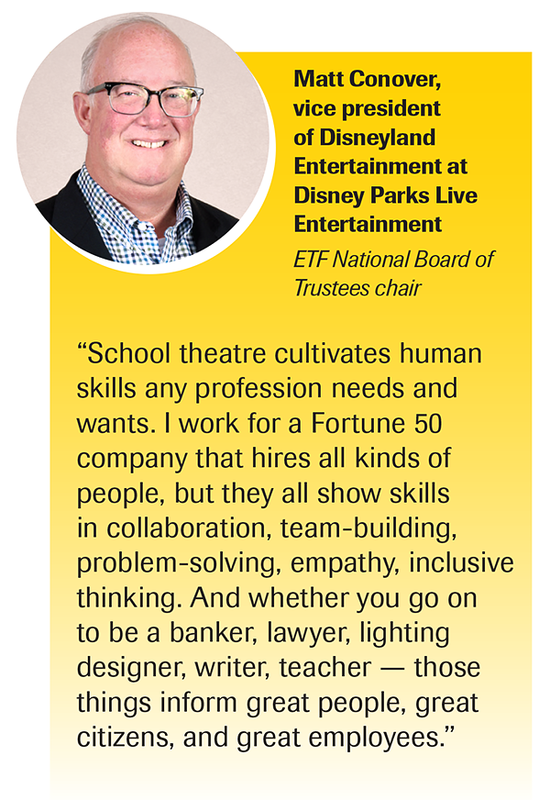 After that, he dove into lighting design in high school and community productions and eventually at the SUNY Purchase College Conservatory of Theatre Arts, where he was taught to think storytelling first and technique second, an approach that has well served his leadership at Disneyland Entertainment. Combs notes that while EdTA and ITS carefully attend to the “annual rhythms” of school theatre programming, the foundation will address “the larger cycle of how theatre education nurtures future generations of performing artists and educators” by providing a means for current educators, other arts professionals, and fans alike to close the circuit through reinvestment. Of course, not every theatre kid will go on to directly enrich the arts and entertainment world through a career in the industry, but programs like JumpStart Theatre demonstrate how theatre education can enrich every kid. James N. Gamble Montessori High School was among the first three schools to participate in the JumpStart Theatre pilot program, which started in 2015. However, JumpStart Theatre wasn’t the only newcomer to Gamble Montessori that year. Za’Khyra Whitehead had also just arrived for seventh grade. In middle school, the thick of what psychologists call “identity formation,” uncertainties and changes — whether physical, financial, or emotional — can isolate and overwhelm. And Whitehead’s family was adjusting to a major financial transition. Yet, on the advice of her school psychologist, Whitehead auditioned for the school’s first JumpStart Theatre musical, Once on This Island Jr. She was cast in a role showcasing her mezzo soprano pipes. And just like that, this anonymous new kid with challenges at home transformed into Erzulie, goddess of love. More importantly, she found friends and got to share a creative project with a team of peers and supportive teachers. Now in ninth grade, Whitehead has aged out of JumpStart Theatre, which targets intermediate grades 7 and 8, but the school principal Jack Jose says that Whitehead’s early involvement in musical productions seems to have made a huge difference. 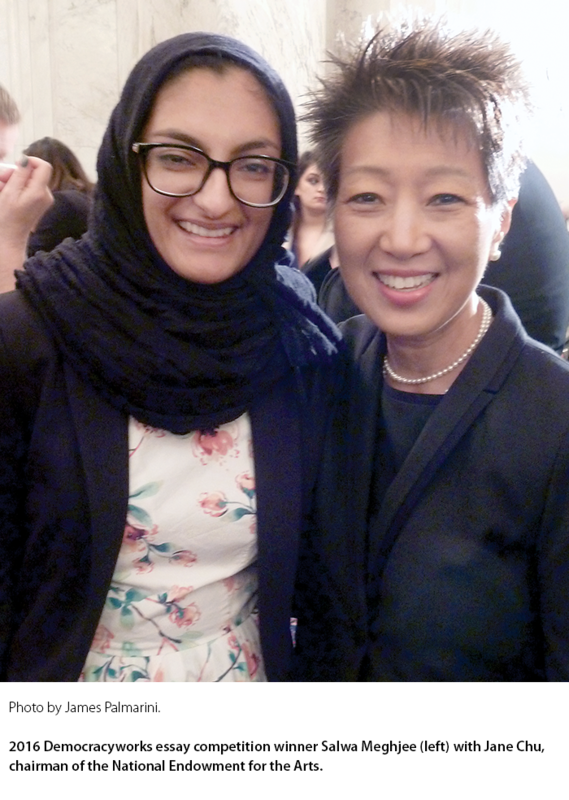 “Now she greets teachers in the hallways, and everybody gives her a hug and knows her name,” Jose says. Gershon began thinking about this more seriously in the 1980s, after attending EdTA’s International Thespian Festival and hearing theatre teachers describe the relative lack of respect and resources they receive compared to other faculty members. Based on this, Gershon began devising study guides that tie aspects of popular and classic plays to national learning standards. He later conceived MTI’s Broadway Kids/Broadway Jr. scripts, which adapt Broadway musicals to 30- to 60-minute versions based on the curricular needs and technical skills of elementary and middle school students. While watching Annie may spark classroom discussions on everything from economic history to political philosophy, being involved in the actual production offers a range of technical, creative, and life skills training that simply cannot be found elsewhere. “Theatre teaches kids how to get along with a team, how to dream, how to inhabit other people’s worlds, how to work together to accomplish something otherwise impossible,” Gershon says. Next year, Gamble Montessori and two other greater Cincinnati schools conclude their JumpStart Theatre training and fully take the helm themselves. Six more Cincinnati-area schools have joined in subsequent years, as the program has added three new schools each year. 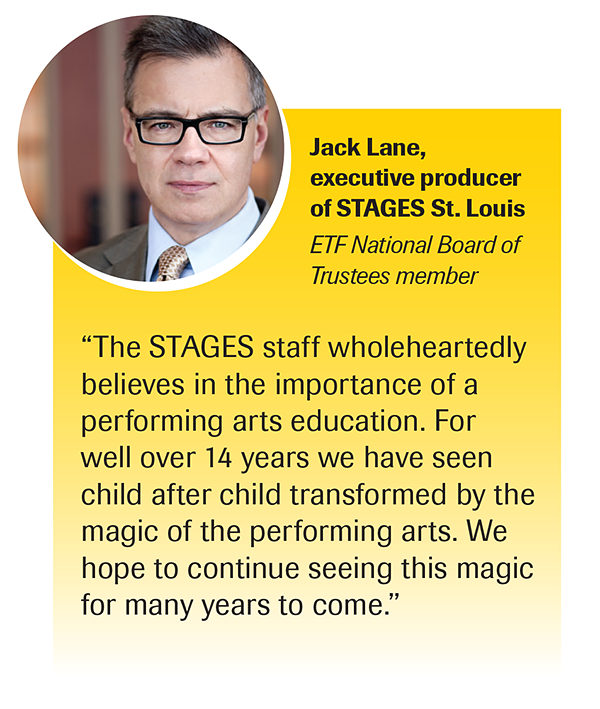 Also next year, JumpStart Theatre will launch its first schools in the St. Louis and San Diego areas, through STAGES St. Louis and the La Jolla Playhouse. 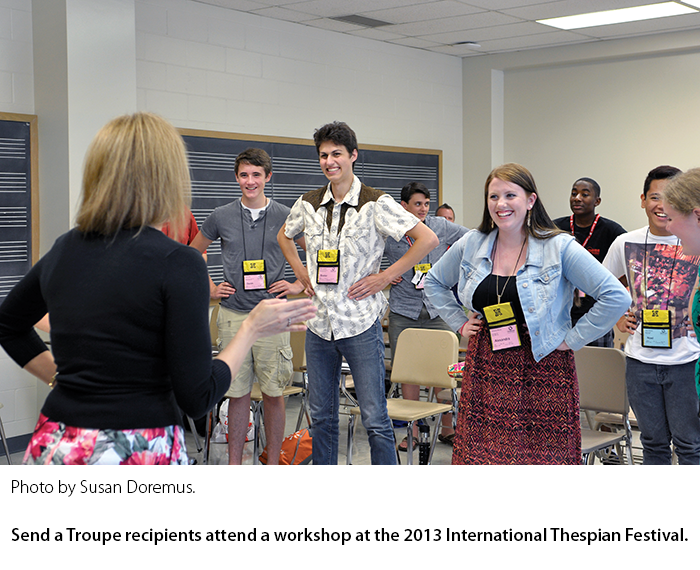 In addition to JumpStart Theatre, ETF provides funding for other EdTA programs, including New Troupe Charter Grants, professional development opportunities for theatre educators, the Send a Troupe to Festival program, competitive grants to enhance school theatre productions, student scholarships, arts advocacy programs like Democracyworks, and individual creative grants for young writers. Pharel wrote Penelope as a junior in Troupe 3637 at South Dade Senior High School, which she describes as an underserved school on “the ultimate south side of Miami.” Playworks fanned her passion for writing and directly contributed to subsequent opportunities, like her participation in the Horizon Theatre Company’s New South Young Playwrights Festival in Atlanta and her acceptance to Barnard College in New York City, where she is now a freshman.